I have had multiple opportunities recently to witness the truth of that phrase from Alfred Lord Tennyson. Those who don't spend much time in nature can tend to idealize it, even Disney-fy it a la Bambi in the woods, etc. That experience of nature can be likened to spending a brief amount of time with someone you enjoy but don't know well, as opposed to spending a whole lot of time with people you love who maybe you wish you didn't know so well! 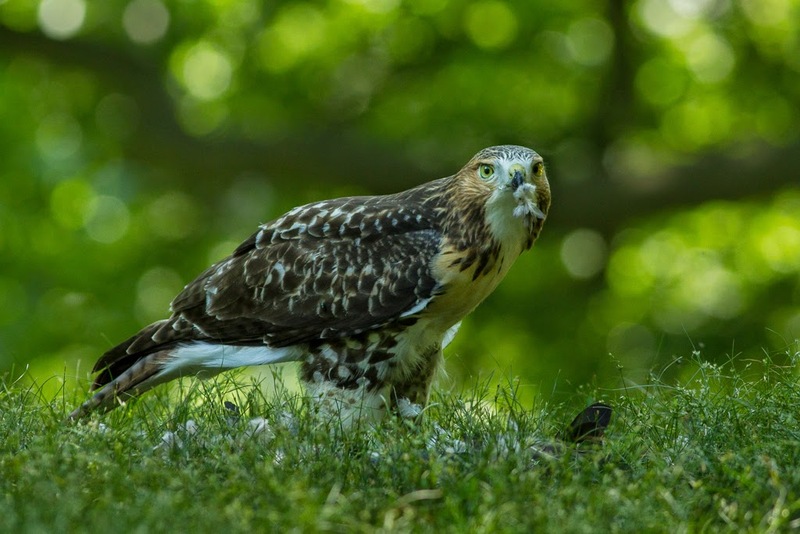 Even here in New York City, in a supposedly tame location such as Central Park, nature claims its own. The beautiful and graceful birds fight each other, destroy each others eggs, deposit their own eggs in another bird's nest to let someone else raise the kids, and constantly bicker over territory. 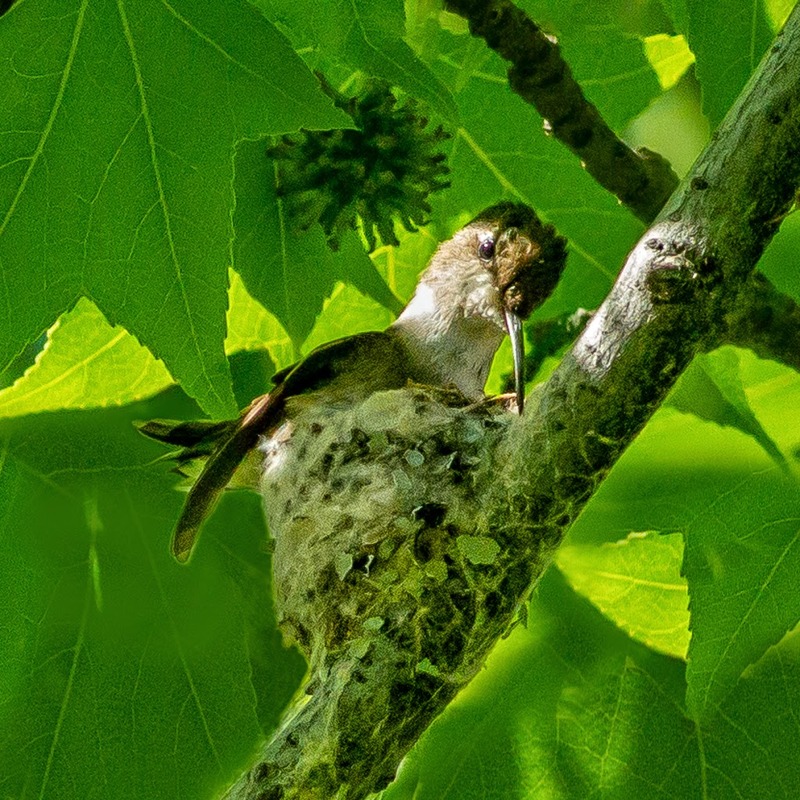 This year saw a female hummingbird building her nest, a rare occurrence that hasn't been documented in the park in many years. Birders rushed to witness this unusual event. And then, whamo, an oriole chased off the female and ate the eggs. And last but not least, today I was lucky enough to witness an interesting phenomenon in the insect world. I heard a cicada and saw something moving around on the ground. 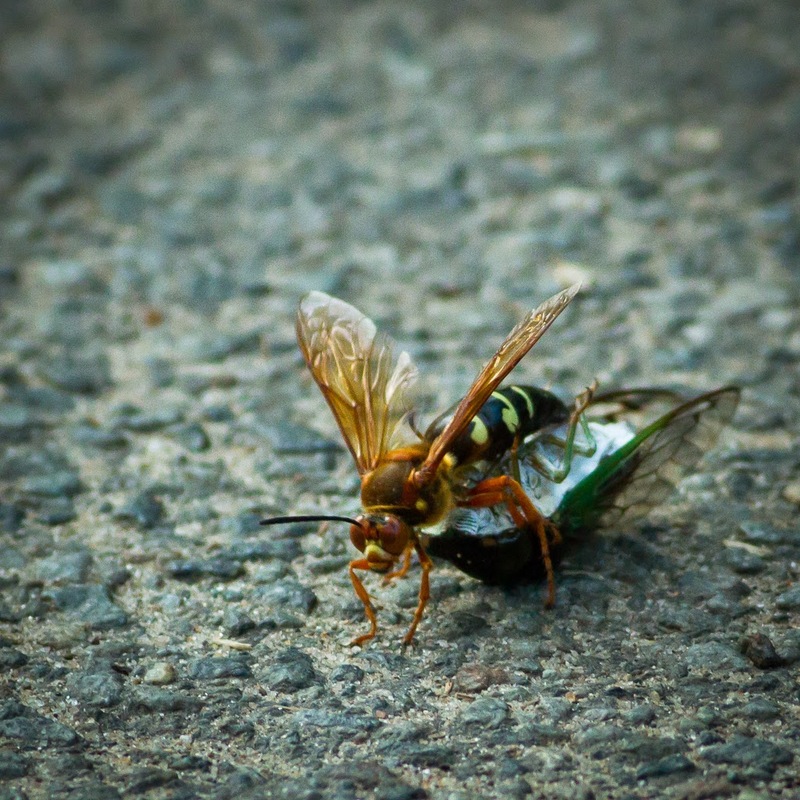 A cicada killer wasp had attacked the larger bug and paralyzed it with her stinger. This female wasp will now lay her egg in the cicada's abdomen and when the larva hatches it will use the cicada for food. Gross to us, but effective and efficient. So enjoy your walk in the park -- breathe in the beauty, listen to the birds, enjoy the flowers ... but remember, roses come with thorns. That's just the way it is. These images are protected by U.S. Copyright Laws and are not to be downloaded or reproduced in any way without the written consent of Sharron Lee Crocker. Comments are welcome! Please feel free to start a conversation with me and share this blog with your friends.